You’d never know it at first glance but this is SUCH an easy quilt to make…my favorite kind. This is a beginner friendly quilt, but I would recommend having some experience with simple piecing and matching seams. This quilt is 57 inches by 71 inches. You’ll be working with some bias edges (fabric cut on the diagonal against the grain) so I highly recommend starching your fabric before you cut. 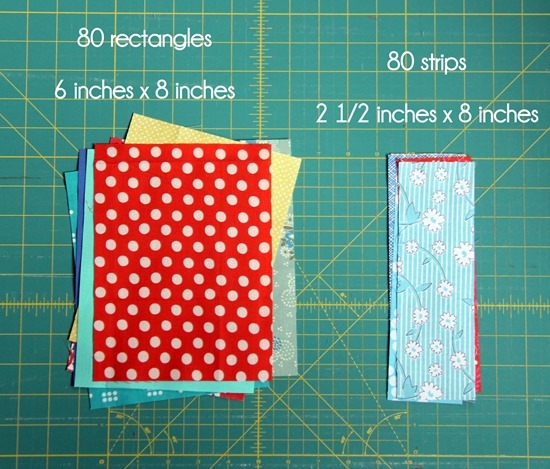 You’ll need to cut: 80 rectangles 6” x 8”, and 80 strips 2 1/2” x 8”. I cut all of my strips from various prints and yardages, but I estimate you’d need about 20 FQ if you were buying fabric just for this. 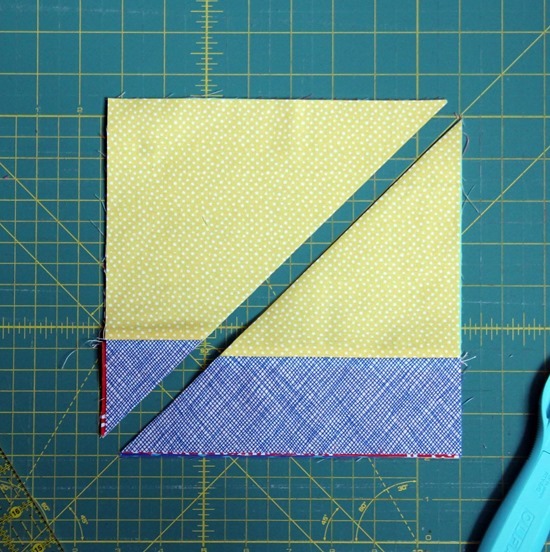 Sew a strip onto the side of each rectangle with a 1/4” seam allowance. Press seams open. Count out 40 of the 8” squares from above. Lay them on the cutting mat like so with the strip at the bottom, and make a diagonal cut from bottom right to top left. You can stack and cut 3 or so at a time to speed this up. Cut all 40 squares like this, keeping the top and bottom triangles in separate piles. Cut the remaining 40 squares, but this time cut each from the bottom left to the top right. Gather all of the triangles with the large strip portions. Place 2 triangles together matching the seams of the strips. Pin and gently sew the triangles together. 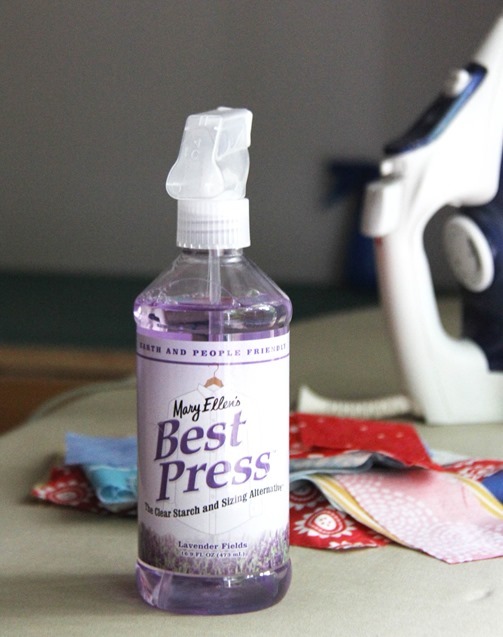 Press seam to either side. Repeat to make 40 of these blocks. Repeat with the small strip triangles to make 40 of these blocks. Your blocks should measure 7 5/8”. Mine were all fairly square so I left them as is and trimmed off the corner bits. 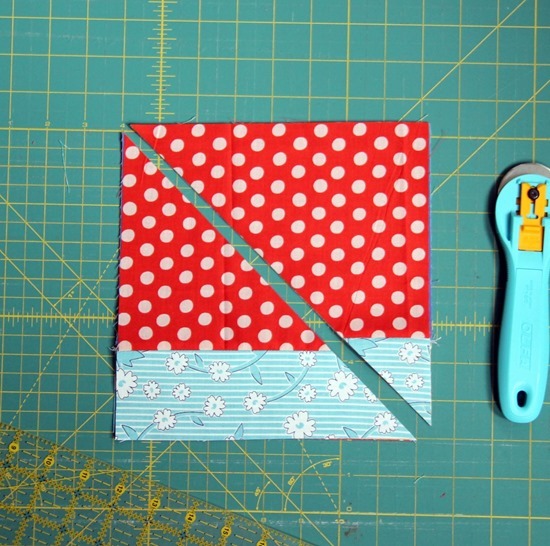 If your blocks are a bit wonky, you can trim them up to 7 1/2”. Layout 4 of the large strip blocks as shown. Pin and sew the right and left blocks together to form two rows, and press seams in opposite directions. Pin and sew the top and bottom together to create the block. Press seam in either direction or open. Repeat to make 10 blocks. Unfinished they should measure 14 3/4”. 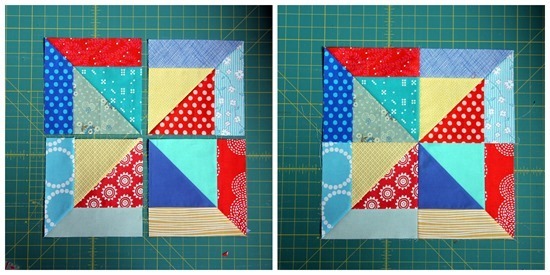 Repeat with the other blocks to make 10 small square blocks. Lay your blocks out into 5 rows of 4 blocks each, alternating in between blocks. 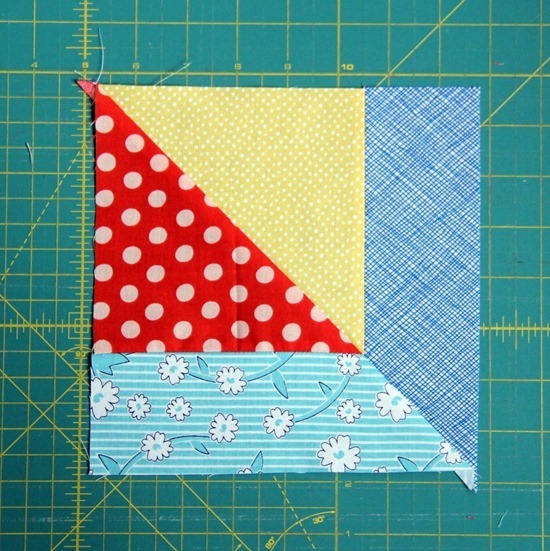 Pin and sew your blocks together to make the rows, press, and sew the rows together to finish the quilt top. If you have any questions leave them in the comments and I’ll answer them in the comments. How fun! Thank you so much. This is going to the top of the list. Brilliant Allison – thank you so much. I love this pattern. You are so creative. I saw the picture and knew that I had to make it. Thank you for sharing and inspiring us! Thank you for the very nice pictoral and measurements! The end result is very pretty and FUN! This is fantastic, thank you!! This looks like such a fun quilt. I want to make one. Fabulous! Look forward to trying this. Thank you. Wonderful. I can't believe how easy this is. You are right, it looks so complex. Love it! Thanks for the tutorial! Thanks a lot for that great tutorial! What a great tut and a fun quilt. Thanks for sharing! This looks so great! You're right, no one would guess how easy it is. I sure didn't! I think you'll have a lot of us making this quilt this summer. Thanks for the super tut as well. Love this! Thanks for a wonderful tutorial. I do like that -and it really looks easy. My only thought was that I could lay the two pieced squares right sides together and sew those diagonal seams to avoid sewing bias edges. Great tutorial! Can't wait to make this…was looking for an easy throw pattern for a throw for this fall! thank you for sharing your tutorial!!! It's adorable. Thank you for the tutorial. 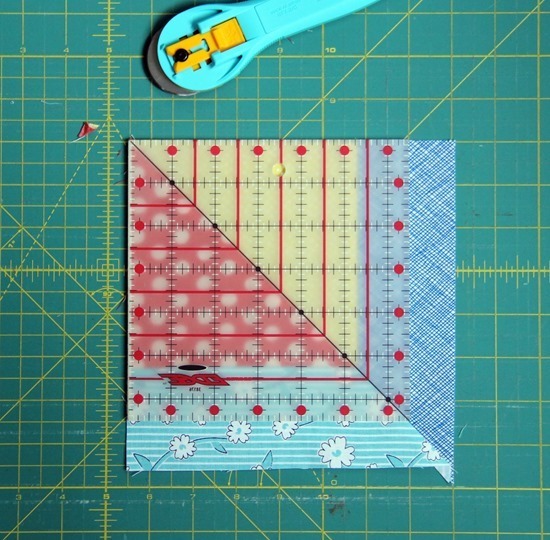 I am gearing up to make a baby boy quilt, and I think your ingenious pattern is perfect for him. Thanks. Perfect pattern for just what I needed to crank out an easy quilt for a gift. I love this! What a great pattern! Love, love, love it…..Can't wait to have some time to call my own. Until then……it will remain at the top of my list in my file of plans!!! 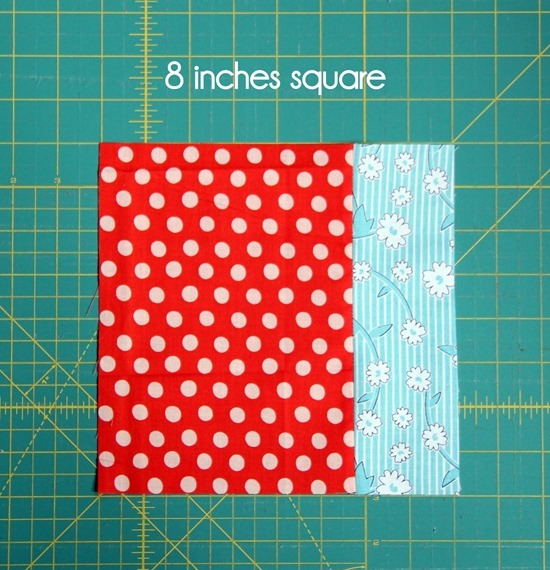 probably not a smart question but….. how hard would it be to make this a smaller "lap" size for charity quilts? maybe 9 squares with a solid border? thoughts? Added to my must make list; thank you for so generously sharing! This tutorial is great! Thanks for sharing! Thank you so much for sharing. This is such a fun pattern. 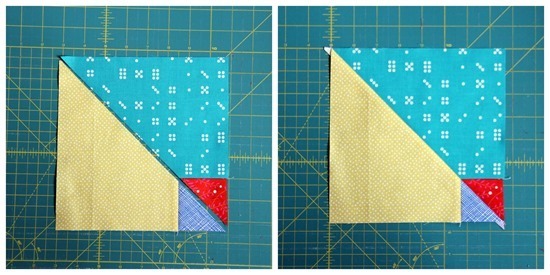 Gene – You can put the squares together and sew on the diagonal like you would a HST to avoid bias edges, but then you don't have as much control over fabric placement in the final block layout. Either way works though! Kellie – Great idea! It would also make a great baby quilt that way without the borders…and it's pretty easy to configure different ways. Thank you for the wonderful tutorial!! I will be making one of these!! I am a beginning quilter and get a little hung up on selecting patterns/colors to go together. Did you cut a certain number of red ones vs. blue ones etc, or did you just cut what you had an put together what looked good in the end? Thanks so much for sharing this tutorial/pattern! Can't wait to try it! Thanks so much, I love a good tutorial. Now if someone would put a scrappy bundle together, I would be set. You really have a gift for sharing….I am grateful! as if I did not have enough to do and now you hare this with us, it is a must for me but will have to go on hold for a while. i fell in love qith this quilt the second I saw it!It's such a fabulous pattern. what a pity htat I have to finish three other quilts first before I can start on this one. thanks a million for sharing! Oh my gosh, I love love love this pattern! Thank you so much for sharing it!! It's so pretty and easy enough for me to create! LOL! Did I mention I love it? So glad that I re-read this tutorial. The time through I thought no way I could do it. Now, it's printed and just waiting for a trip to the fabric store for supplies. Thanks so much for writing and sharing this tut. What would the measurements be for a smaller baby quilt around the size of 40x51ish? I love the quilt and want to try it for my grandson who is on the way! Thanks! You are a very talented, clever woman. Thanks for sharing. 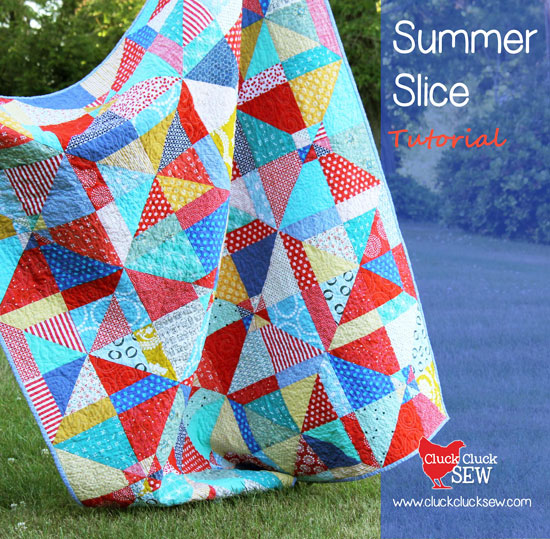 How did you quilt "Summer Slice"? I tried to look closely to the picture, but it was not easy to see. I've had the itch to start quilting, have been looking at patterns but once I saw this one and read through your very clear instructions I knew for the first time I really could do it! I'm so excited… thank you so much. This is a really cute project, and it makes me happy to read comments like the one just above mine and to know that you are inspiring new quilters to take the plunge and start their very first quilts! You are brilliant! and kind to share with us all. I need to make this – This may bump up to the top of my to-do list. Linda – I LOVE hearing that!!! 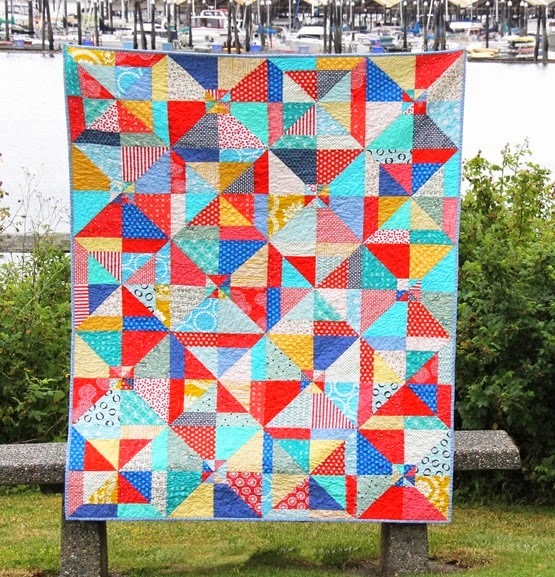 Quilting is so much fun and you can definitely make this quilt! I have already started making my version of the quilt; I am using 82 different fabrics so it will be really scrappy! I will keep updating on my blog. Beautiful quilt. Thanks for sharing. Love it, love it!!! Thank you so much! I love this. I think it would be ideal for leaders and enders (Bonnie Hunt). I have plenty of scraps. Would you recommend this as a beginner quilting experience? Yes Katrine! I'd make sure you've sewn a little before you start….make sure you've got a good 1/4" straight seam allowance down and pinning…and you should be fine! I just finished piecing this. I ended up needing 18 fat quarters (using every little bit). Thanks for the great pattern. I love my new quilt top! This will look great as a Quilt of Valor for a Coast Guard "Coastie." Just saw this pattern on a blog showing a finished Halloween quilt. Love the idea of getting such a complex look from a bit of clever cutting and arranging, thanks so much for sharing. Will definitely add it to the “to make” list. What is the size of the small 1/2 sq triangles. Wow, another fun quilt. Beautiful. Looks easy…but can’t understand how u got the small square together…. Marie and Charles, like you, I couldn’t figure out how to get the small triangles. But I think I figured it out. The “large” blocks have the 2 1/2″‘ border on the outside. 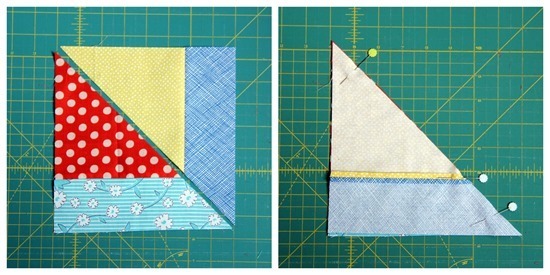 For the smaller triangle, turn the half square triangles so the borders are in the inside of the block. 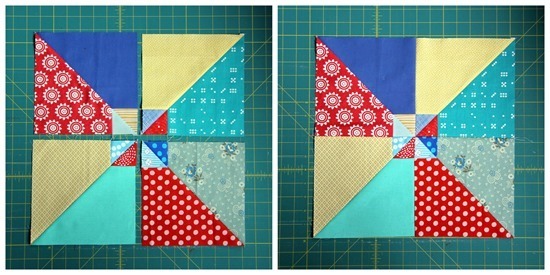 There are always so many ways to turn HSTs, I am sure there are other variations to try. Love, love, love this! I am a beginner, but the clarity of your tutorial made me believe that I could tackle it. Thank you so much. I am SO WOWED!!! I just LOVE this simple design!! I am going to attack my scraps ASAP!!!! Thank You for Sharing!! I cannot figure how to cut a fat quarter to get 5 rectangles and 5 strips. The most I can get is 4 of each. I think a better estimate of fat quarters needed is 20. Thank you for this brilliant article!